Custom qualities with fully-assembled convenience! Put all of the amenities you need for food preparation, cooking and grilling within arm's reach in the custom configuration that is perfect for you. Whether "L" Shape, "U" Shape or Straight you can arrange the components to create the kitchen of your dreams. Ready to be joined together, the 4 open-air kitchen modules were designed to achieve a perfect fit using advanced laser technology. 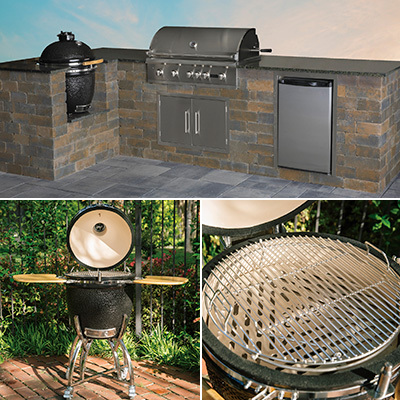 COMPLETE WITH... a gleaming, easy to clean and maintain, stainless steel appliance package with all the features that outdoor cooking aficionados have on their wish lists for multitasking the cooking and grilling of meats and vegetables in a variety of ways. Custom qualities with fully assembled convenience! Put all of the amenities you need for food preparation, cooking and grilling within arm's reach in the custom configuration that is perfect for you. Whether "L" Shape, "U" Shape or Straight you can arrange the components to create the kitchen of your dreams. Ready to be joined together, the 4 open-air kitchen modules were designed to achieve a perfect fit using advanced laser technology. With All Stainless Steel Appliance Package Complete with 4 pallets of Olde English Wallstones, 2 concrete lintels, and a top of the line stainless steel appliance package, which includes: 38" grill with 2 lights for nighttime cooking, refrigerator, sink, and cabinets/access doors, all set in a polished granite countertop. Granite countertop comes in 2 color choices: Black Uba Tuba or Venetian Gold. Ready to Install... absolutely NO cutting necessary. Step by step instructions in English and Spanish included. Kitchen is designed as a left side "L" shape. A right side "L" shape is also available. 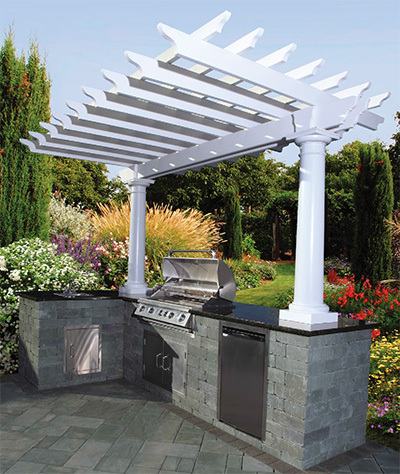 NOTE: Should you purchase the optional Pergola Kit (shown above right), which requires concrete footings, it must be installed at the same time as the Outdoor Kitchen Kit. Pergola Kit cannot be added afterwards. 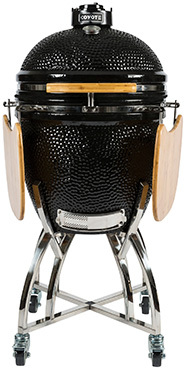 Cooking area: 38"W x 20"D 5 stainless steel (15,000 BTU) burners with auto ignition, rotisserie, built-in thermometer, warming rack, and slide out grease tray. Complete with 4 pallets of MaytRx Wallstones, 2 concrete lintels, and a top of the line stainless steel appliance package, all set in a polished granite countertop. Ready to install... absolutely NO cutting necessary. Step by step instructions in English and Spanish included. Shown left in Split Face Sahara/Chestnut with Venetian Gold granite. Size: 9' 9"H x 12' 10 1/2" W x 8' D.
NOTE: Should you purchase the optional Pergola Kit, which requires concrete footings, it must be installed at the same time as the Outdoor Kitchen Kit. Pergola Kit cannot be added afterwards.